Tong Gallery+Projects is delighted to present "Penumbra Phase", Liu Xia's third solo exhibition, also his second one with the gallery. 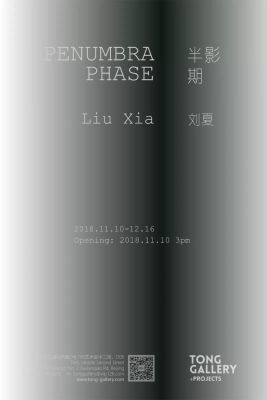 The exhibition will showcase a new series of oil painting of Liu Xia and last until December 16th, 2018. Penumbra refers to the semi-bright, semi-dark part of the shadow casted by light from the opposite side. When the illuminator is overwhelmingly strong, the shadow as pure darkness will disappear. Without darkness in the opposite side of light, only the endless and vague grey is left. However, darkness will not disappear in itself. Rather, it is just waiting for the waning of light. The Penumbra Phase transforms into a temporal concept, which stands for a transitive period from brightness to complete darkness; or the other way around from darkness toward the dazzling brightness. Liu Xia depicts a group of young people, who have their emotional support, searching for identity. They are hostile and act in a group or they are isolated, faithful and easy to be touched. The artist also depicts doctors who are relieving their physical and mental stress.